Pretty funny of T-Mobile, right? Take shots at a company who just experienced more than 24 hours of down time on their brand new 4G LTE network. 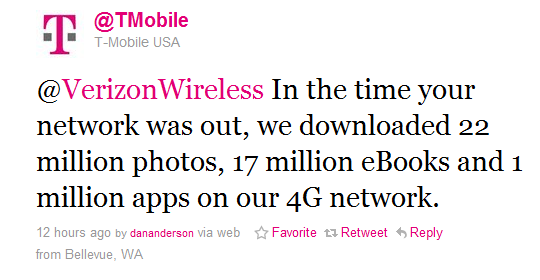 Hey, I’d do the same too if I were a competing carrier. The only thing is, T-Mobile doesn’t even have a 4G network. That’s right, I’m pulling out the “Fake 4G” card, because when it comes to trash talking, you have to at least have something legit behind your stance…and they don’t. And while Verizon’s outage was one of the most preposterous things I’ve ever seen from a company this large in a long time (and we are still owed an explanation), I’m just going to shake my head at T-Mo and ask that they keep trying. Or better yet, why don’t you go sell your soul. Oh, that’s right, you did…to AT&T.